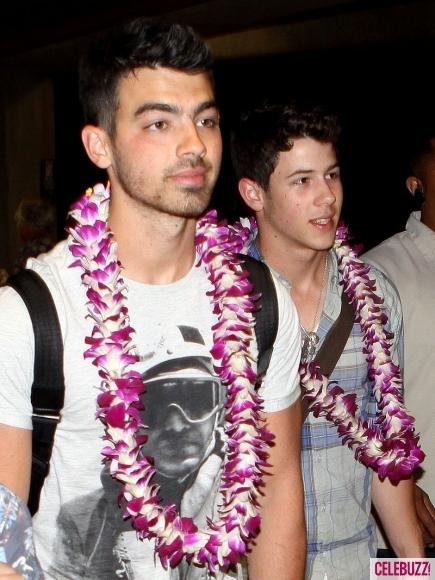 Joe and Nick Jonas arrive on Maui. Photo by Celebuzz. The Jonas Brothers and their family arrived on Maui April 20 for a family vacation. The entire family, except Kevin and his wife, were first spotted at the airport before getting out in the sun for some fun. Later that day, the family cruised along Front Street in Lahaina and then ate at Da Kitchen, a loved place with local flavor. The family reportedly was interrupted 30 times during their meal. Nick and Joe did not let it bother them. They graciously greeted fans and posed for photos. Thursday and Friday they were fairly low-key, spending time at their hotel, swimming in the pool, and hanging out on the beach with Bonus Bro, Frankie. Friday night, the family attended the Old Lahaina Luau incognito. They must have remained fairly discreet as no photos or spottings have surfaced – except the Tweet with the original information – thanks Twitterverse. Pacific Reader posted these photos. they should be left alone to enjoy their vacation time. Not quite incognito, I was seated at the next table, with my back up against Nick. There were a few pictures, which they were very gracious to do. But it was nice to see most people give them their space for a nice evening. I did come out with the lei Nick was given at the beginning of the evening as he left it hanging on the chair when the family left just before the last dancer was finished. Made a wonderful gift for one of my nieces… she was thrilled.